Chamberlain’s warm ginger-asparagus salad is, indeed, food for the soul. 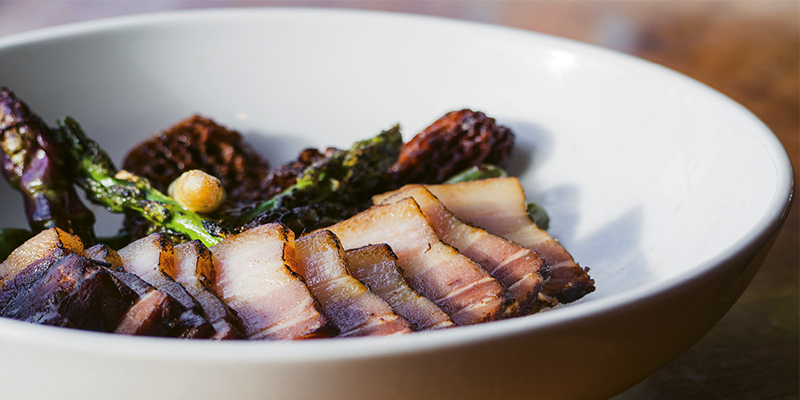 In it, he uses braised and browned pork belly (which renders the skin crisp and the inside tender), sautéed asparagus, and morel mushrooms, all drowned in a tangy ginger-spiced soy vinaigrette. This spring, when asparagus and morels are at their best, try his recipe at home (using chopsticks, of course). Cure the pork belly anywhere from one to three days ahead of time by mixing three cups each of salt and sugar. Rub the mixture all over the pork belly, cover, and refrigerate until ready to braise. To braise the cured pork belly: Rinse off the curing mix with cold water, and cut pork belly into one and a half-inch squares. Line a metal baking dish or Dutch oven with one sheet of dried seaweed and spread the pork, then cover with another sheet of seaweed. In a bowl, mix soy sauce with warm water to create a braising liquid. Pour over the seaweed and meat, and cook on the stove over low heat for two hours. Remove braised pork belly and set aside. Discard the rest. In a separate large pot, boil generously salted water and blanch the asparagus for two minutes. Strain and place in an ice bath to retain crispness and color. To prepare the vinaigrette: Purée spring onions and ginger in a food processor. Add vinegar and blend, slowly adding the oil. Season with salt to taste. In a heavy-bottom sauté pan over medium heat, brown the pork belly, about one to two minutes per side. In a separate sauté pan, heat cooking oil over medium-high heat. Cut asparagus into one-inch sections, and sauté with mushrooms for about four minutes. Remove from heat and ladle two ounces of vinaigrette into the warm pan and toss with vegetables. To serve: Divide sautéed asparagus and mushrooms onto plates. Slice the cubes of braised pork belly as thin as possible and place on top. Drizzle vinaigrette on top of the pork belly and serve warm.